I’m asked this question all the time… How to prepare for a job interview after getting fired? How do you explain yourself and answer all the tough questions they’re going to ask you? I’m going to walk you through this step-by-step. I know it’s nerve-racking because I’ve been fired too, but once you know what to do, it’s going to be a lot less intimidating. Okay first, you’re going to want to be upfront and have a quick, clear explanation for what happened in your last job. Don’t go on and on and create a long drawn-out story. Don’t blame the company or badmouth. Ever. Don’t seem hesitant, or seem like you’re hiding something. Do show that you’ve taken steps to make sure it never happens again. After the step above, you’ll want to quickly re-focus the conversation on your skills and how they match with this new company’s needs. When someone is fired there’s a tendency to panic and apply to every job out there (and be willing to accept just about anything too). Here’s the problem: Employer don’t want that. They want someone who is being careful and selective in their job search. This is something I talk a lot about in my job interview answer guide because it’s so important to show. So after you’ve explained why you got fired and what you’ve done to make sure it NEVER happens again, pivot the conversion and show them why you want THEIR specific job. If you follow these two steps, it’s going to make a HUGE difference in how you perform in job interviews after being fired. Getting fired is tough, I know as well as anyone because it’s happened to me. Right after Christmas. But if I had taken this advice instead of trying to hide it and cover it up, I would have found a job much faster. 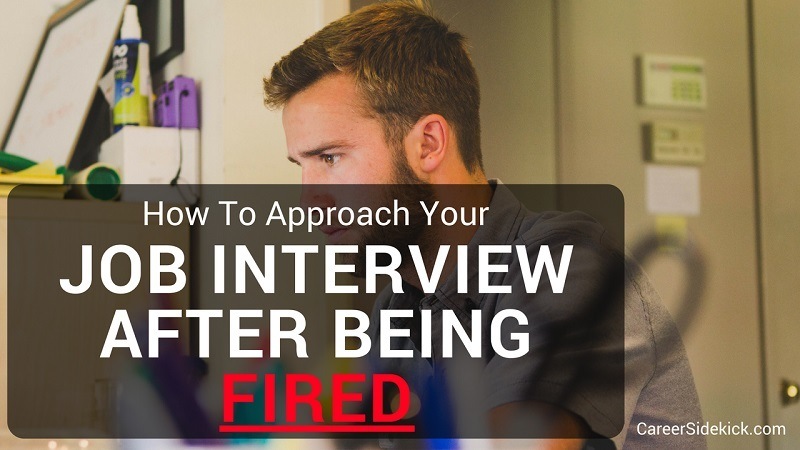 That’s why I suggest this method every time someone comes to me for help with a job interview after getting fired. It’s okay to tell a white-lie, and my favorite is what I used above… saying you’re still early in the process and just starting to get some interviews. You’re showing them that you know a bit about them, they fit what you’re targeting, and that you’re getting attention from other companies and you’re not desperate. That’s it. We’ve covered the 3 most important steps in your interview after being fired. Note: If you want more general job search help, I recommend this article on how to conduct your job search after being fired. It’s going to help you find more job leads to apply to, and get more interviews.